After their recent launch of Sukar.com the region’s premiere private shopping club, Jabbar Internet Group has set to launch their first Group Discount portal called Cobone.com, their latest addition to the group’s already 5 company strong arsenal. 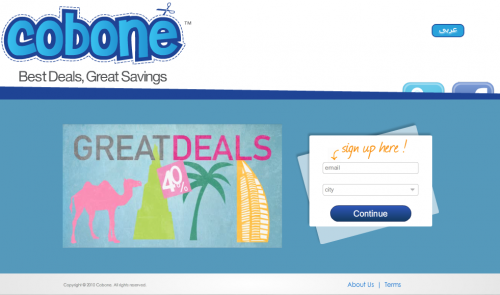 Cobone.com (mocking/matching Arabic pronunciation of the word Coupon in English) takes aim at the market GoNabIt.com (in which Bayt.com is the majority owner) has recently witnessed some success in, adopting the model globally known as the Group Discount Model where website customers are rewarded with product discounts for limited periods of time provided a large number of users make the purchase. Jabbar Internet Group is the umbrella company of such names as Souq.com (the Middle East’s version of eBay), Sukar.com and CashU among others, making it the region’s largest e-commerce group and online payment facilitator. Cobone.com will be launching the service initially in Dubai in both English and Arabic, but with Jabbar’s current reach, the entire region is a simple task they should be able to cover in no time. Cobone.com’s founder and CEO Paul Kenny was Senior Digital Marketing Executive at AMEinfo.com and despite the short period in the Middle East he might have a good grasp on doing business in Dubai from his 3 year’s experience working for other prestigious firms such as Jumeirah and Dubai Holding as well. Upon the launch of GoNabIt which we covered here, we spoke to Dan Stuart where he mention to us “we hope to educate the market, then expand providing a new service that will allow collective customer action to make the deals a reality”. Jabbar Group has obviously learned the lesson and in only two months after the launch of GoNabIt, which will put the heat on Bayt.com’s investment resulting in some interesting deals and discounts for the online deal seekers, I for one can’t wait to benefit from. We’ve contacted the founder for more details and will update you as soon as we hear back from him, meanwhile you can check out their Facebook page which they launched an hour ago for more information.